Weird? Or, Wonderful? More Companies Move Toward eVTOL …Will Sport Pilots? Workhorse's SureFly octocopter takes it's first hop fitted with "training wheels." What on Earth is going on in Airplane DesignerLand? Are we headed for a bifurcation, a parting of the ways among those engineering the next generation of aircraft? Perhaps. Will this affect you? How do you feel about non-fixed-wing aircraft? I am searching for a term to generically describe these emerging flying machines; "drones" doesn't quite do the job. More of these seemingly-weird-looking machines seem to pop up every day. Prior experience suggests that most will never make it to market. 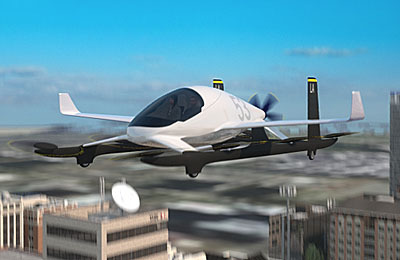 Ones that do succeed in the eVTOL or electric-powered aircraft market may not even exist today. For that matter, it is far from certain that this will ever turn into a market, though given the huge amounts of money pouring into research projects, it seems nearly inevitable (to me) that some will survive and perhaps have a major impact on flying, both for transportation and for sport or recreation. 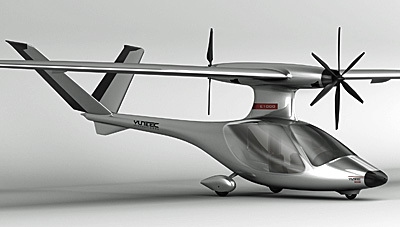 Wave eVTOL uses distributed power near the wingtips for cruise flight. Along this vein, before and at Sun 'n Fun 2018, I spoke to officials from BRS parachutes. They reported being intensely busy fielding requests for ballistic parachute systems from eVTOL creators. You know STOL and probably VTOL (Vertical Takeoff and Landing). EVTOL is the electric powered version of the latter and it's a space where literally billions may be spent; many hundreds of millions already have been. 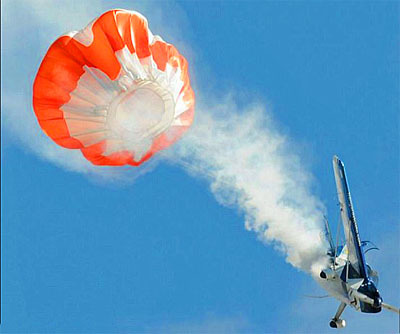 No wonder the interest in a parachute rescue system. While multicopter aircraft have the potential to be even safer than conventional aircraft with wings, that safety hinges on software robustness. Electric motors are much more reliable than combustion engines but an aircraft with no wings depends utterly on several spinning props doing their job. Developers say they can lose some and still get safely to the surface. I don't doubt that but doing so leans heavily on highly capable software. Remember how often your Windows computer crashed 20 years ago? No one wants that in their aircraft. However, modern computers and now tablets and smartphones rarely crash. The same sort of evolving development will likely happen to this merging of infotech and aircraft. 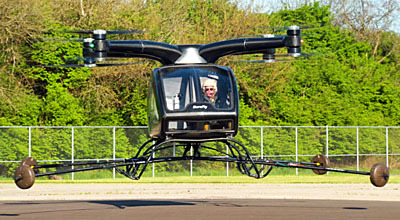 On April 30th, Workhorse's SureFly octocopter (see our earlier article) took its first untethered flight. It lasted a mere 10 seconds but they've continued flying since. Workhorse co-founder and CEO Steve Burns said, “The first [untethered] flight proved to us what we needed to know: the energy used, the noise [level], the ease of control with the joystick, the balancing algorithms." Unlike multicopters such as SureFly, Wave eVTOL "is a transitioning tilt rotor aircraft… designed to take off vertically and then transition to flight like a normal aircraft," reports Vickers. 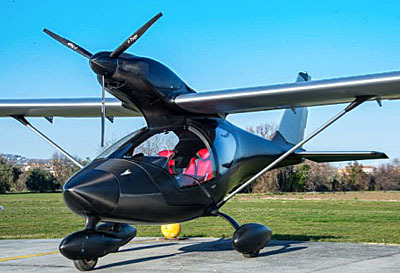 A piston-powered SureFly is designed to fly up to 75 miles at a speed of approximately 75 mph, with an anticipated empty weight of 1,100 pounds and a maximum takeoff weight of 1,500 pounds. A 400 pound payload seems underwhelming but these developments are at an early stage. 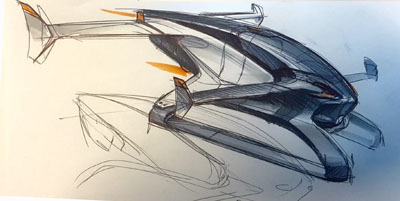 What happens when our current batch of deeply-experienced airplane designers get involved with this new action? Will they abandon our beloved LSA airplanes, trikes, gyroplanes, powered parachutes, and motorgliders for aircraft with multiple spinning props or pivoting wings? Maybe it's already happening. What on Earth is going on in Airplane DesignerLand? Are we headed for a bifurcation, a parting of the ways among those engineering the next generation of aircraft? Perhaps. Will this affect you? How do you feel about non-fixed-wing aircraft? I am searching for a term to generically describe these emerging flying machines; “drones” doesn’t quite do the job. More of these seemingly-weird-looking machines seem to pop up every day. Prior experience suggests that most will never make it to market. 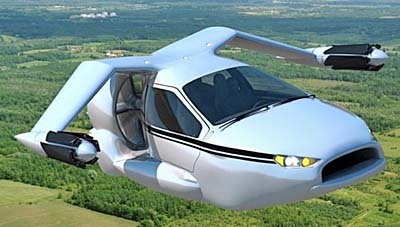 Ones that do succeed in the eVTOL or electric-powered aircraft market may not even exist today. For that matter, it is far from certain that this will ever turn into a market, though given the huge amounts of money pouring into research projects, it seems nearly inevitable (to me) that some will survive and perhaps have a major impact on flying, both for transportation and for sport or recreation. Along this vein, before and at Sun ‘n Fun 2018, I spoke to officials from BRS parachutes. A large format machine marks carbon fiber pieces for cutting. Now that we are in the middle of winter, activity is brisk. Middle of winter!? Down under in New Zealand, residents are presently in the colder months of the year. Pilots in U.S. states currently sweating through summer may need a moment to ponder that. New Zealand may be a long ways away but the Vickers Aircraft team building Wave are bringing their fascinating aircraft ever closer. As they work, they are gaining experience with new equipment used to build Wave LSA seaplanes. "Our tooling is all in place now," said CEO Paul Vickers. "Initial parts are coming out of molds and they are matching the CAD files perfectly." Modern design, even of more affordable aircraft, are often fully created on computer work stations. The days of hand making a prototype are passed and the older way is nearly extinct. Scanning the mold assures the final part will precisely match the original CAD file. "We've also recently doubled the size of our facilities," added Paul. As the New Zealand company moves steadily toward initial production, design work is mostly complete and the translation of that computer effort has transitioned to initial fabrication. "We have carbon fiber clean rooms to make or 'pull' parts from molds," said Paul. The combination of computer design and laser cutting of raw material allows a faster move to building parts and the magic of this modern method is components that are right the first time. How do workers at Wave know the parts are right? The answer is more high tech equipment. In the nearby photo, a lower wing skin mold is 3D scanned using a hand held instrument. The surface of the mold is verified to assure it precisely matches the CAD file. In the image you see a series of dots, which are stickers applied to the mold. The dots identify reference locations used by the hand held scanner to assist the worker. Parts resulting from the CAD process lead to much faster production capability. "We've digitally designed the aircraft and the scanning is a validation that the part matches the design," explained Steve Hamblin, an engineer with very applicable experience from another LSA company. Steve moved from the USA with his family to assist the Vickers Wave effort. Taking your family half way around the world shows a level of commitment to this highly-anticipated project. Wave boasts many intriguing features and further distinguishes itself by being the first LSA seaplane planning to use the potent Titan X-340 engine from Continental Motors. With 180 horsepower, Wave should be a most enthusiastic performer. As Icon continues laying the groundwork for serial production of their popular A5 (more than 1,500 orders have been placed, said Icon), Vickers has attracted great interest in his LSA seaplane of advanced design. Paul reports many customers have approached him, keen to know more. Typical of the lower-key way Vickers is conducting their development, the company does not report orders nor promise dates yet but that is not holding back interest from pilot consumers. 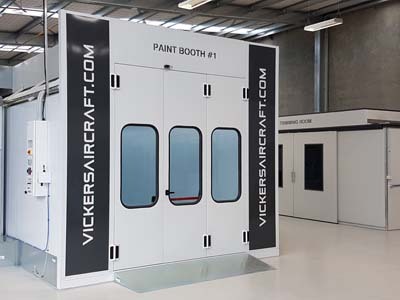 A sophisticated paint booth and related high tech tooling required Vickers to double the size of their production facility. "We are fully funded and moving according to plan to get our Wave ready for production," observed Paul. In addition to the primary task of preparing Wave for production, Vickers leadership and engineers are working on the Wave Pilot Operating Handbook, maintenance manuals, and additional documentation. All this will be needed when FAA later schedules a visit to approve the company. After changes a few years back, FAA has the option to perform a full company documents audit before a new Special LSA can gain agency acceptance. With an innovative design like Wave, FAA inspectors will surely take the option. "We a building a company as well as a plane," stressed Paul Vickers! The many who have expressed an interest in Vickers Wave have a golden opportunity to find out more… soon. You can hear the latest on this impressive design directly from the source. "We received confirmation from EAA on the time slot for our forum and meet & greet at AirVenture 2017 in Oshkosh, Wisconsin," said Paul. Vickers Aircraft will be at Forum Stage 2 at the Forums Plaza (Knapp St.) from 1:00-2:15 pm on Tuesday, July 25th. Here's a show grounds map to guide you. "Although the aircraft will not be present, we will be giving a short presentation about Vickers Aircraft and the Wave," said Paul. This provides an excellent time to meet with a few of Vickers' key people, including Founder and CEO, Paul Vickers. Now that we are in the middle of winter, activity is brisk. Middle of winter!? Down under in New Zealand, residents are presently in the colder months of the year. Pilots in U.S. states currently sweating through summer may need a moment to ponder that. New Zealand may be a long ways away but the Vickers Aircraft team building Wave are bringing their fascinating aircraft ever closer. As they work, they are gaining experience with new equipment used to build Wave LSA seaplanes. “Our tooling is all in place now,” said CEO Paul Vickers. “Initial parts are coming out of molds and they are matching the CAD files perfectly.” Modern design, even of more affordable aircraft, are often fully created on computer work stations. The days of hand making a prototype are passed and the older way is nearly extinct. “We’ve also recently doubled the size of our facilities,” added Paul. 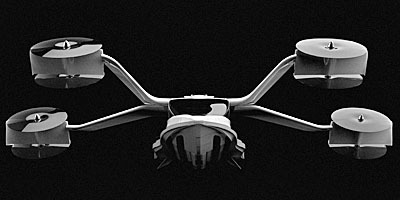 https://www.youtube.com/watch?v=hFVTAEYybq8#action=share Among all Light-Sport Aircraft, some of the most intriguing new design qualities are emerging from LSA seaplanes. Icon's A5 has gained a ton of attention but here's a new entry from Vickers Aircraft of New Zealand. This aircraft is -not- yet flying (as of late 2016) but is such an innovative engineering exercise that we wanted to interview designer Paul Vickers when he was in the USA arranging aspects of Wave's debut in America. Stay tuned; we're sure to have more! Among all Light-Sport Aircraft, some of the most intriguing new design qualities are emerging from LSA seaplanes. Icon’s A5 has gained a ton of attention but here’s a new entry from Vickers Aircraft of New Zealand. This aircraft is -not- yet flying (as of late 2016) but is such an innovative engineering exercise that we wanted to interview designer Paul Vickers when he was in the USA arranging aspects of Wave’s debut in America. Stay tuned; we’re sure to have more! This simulated image shows what Vickers' Wave will look like as it takes flight later this year. Pilots not closely following Light-Sport aviation can be excused for thinking only one LSA seaplane is available. Established LSA companies like Progressive Aerodyne and their Searey or Scoda's Super Petrel or Airmax's SeaMax or any number of aircraft to which floats have been fitted may be somewhat baffled by the outsized attention Icon Aircraft's long-delayed A5 receives from aviation and non-aviation media. On the other hand, most leaders of these companies do admit that Icon's media juggernaut also brings attention to LSA seaplanes in general. With that in mind, are you ready for one that might out-WOW the A5? You cannot ride a Wave today, but 2017 may be the breakout year for this impressively-configured LSA seaplane entry from the other down-under country of New Zealand. Indeed, principal, Paul Vickers -- the namesake of Vickers Aircraft -- wrote at the end of 2016, "Great strides have been made in the past months here at Vickers. We may have appeared quiet but we have been very busy preparing for 2017, which will prove to be an incredible year." 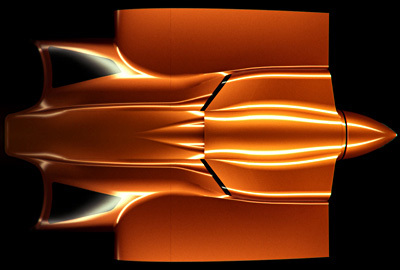 See an earlier article on the company and read about Wave's use of the Titan engine. Any company making a product as advanced as A5 or Wave (or Lisa or MVP) requires two ingredients never in sufficient supply, it seems: time and money. Reams have been written about Icon's ambitious fund raising and the other developing LSA seaplanes just referenced have also been active in the finance arena. Vickers was working hard at this 18 months ago, but found solid financial support a while back. This allows them the ability to concentrate all their energies on finalizing the aircraft. Paul confirmed this impression when he wrote, "We have secured funding from the USA that will allow us to expand our operations." He continued, "New machinery for carbon fiber part production and larger premises will streamline our processes." He noted that additional staff was hired to fill key roles to ensure smooth production and timely deliveries. "I traveled to various U.S. states in 2016 to personally meet with potential investors and found the ideal partner in Florida," said Paul. "Our new partner brings not only a vast wealth of aviation knowledge but incredible American business experience which will ensure a strong and responsible Vickers brand in the USA." With adequate funds in place, Vickers is charging ahead. You are reading it first here that Vickers recently moved into what they call their "Stage 1 production facility," located at Hamilton Airport, New Zealand. This first stage of three will enable Vickers to produce 30-40 aircraft per year, according to Paul. "In this new temperature controlled environment production carbon fiber parts are being prepared in accordance with manufacturing procedures that have been finely tuned over years of development," he explained. "It has always been of extreme importance to maintain control, quality, and cost over all components for the Wave. This has allowed for a modest investment and will result in an actual aircraft that will be both deliverable and affordable provided by an aircraft company that is sustainable." "We have been developing the processes to produce conforming production components and we are very close to beginning structural testing on production sub-assemblies such as the wing carry thru and rear empennage." Nearby you see a recently infused carbon fiber mold insert just prior to trimming and finishing. 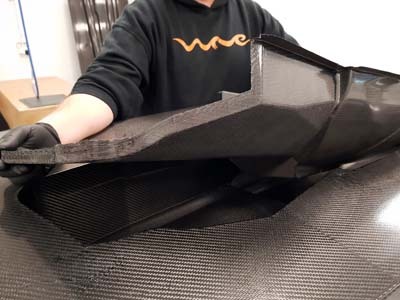 TenCate Advanced Composites USA has joined Vickers as a strategic partner to supply carbon fiber materials for Wave. 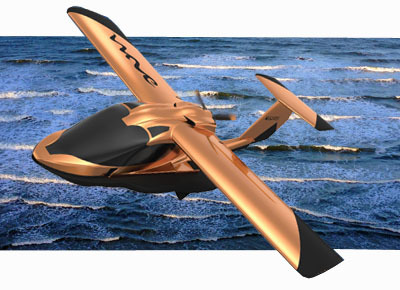 "TenCate is pleased to support Vickers Aircraft with carbon fiber epoxy prepreg and ancillary composite materials for the development and production of their Light-Sport Aircraft," said David Clarke, CEO of TenCate. "We look forward to their successful introduction of this unique aircraft platform." "Working with TenCate's superior products will enable us to produce an aircraft which will be of the highest quality yet help keep weight within LSA specifications," noted Paul. "TenCate is a leader in the aerospace composite industry and having them work with us to bring our aircraft to market will help make Wave exceptional." 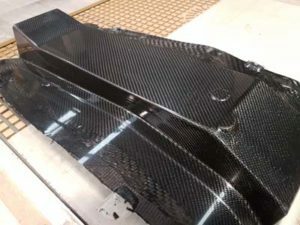 Most readers know that carbon fiber is wonderful to combine strength with low weight but preparing the material for use on aircraft is an exacting effort. "We have now acquired a critical part of our production process, a Zund carbon fiber cutting center," said Paul. The Zund cutting machine can cut carbon fiber at an astonishing three feet per second, ink mark part numbers and bar codes to integrate individual pieces of carbon fiber into our inventory system to ensure full traceability and correct placement during laminating." He added that the Zund cutter has the capacity to produce parts for more than 100 aircraft per year. 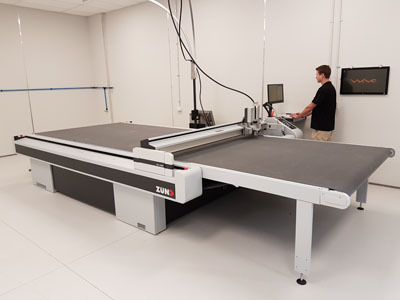 "We looked globally at other industry leaders and concluded that Zund was a stand out within composite manufacturing companies," reported Darryn Todd, VP of Composites for Vickers. 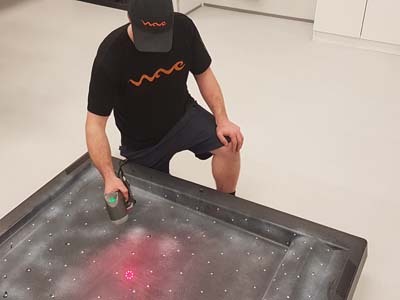 Along with the fresh funding Vickers has also appointed the American distributor for Wave. "We are very pleased to have such strong support from the USA," exclaimed Paul. "We are equally excited to have appointed a U.S. distributor in Florida, the ideal location for Vickers Aircraft USA." Changes have been made to the Vickers Aircraft website and it now conforms to all screens including mobile and tablets. Pilots not closely following Light-Sport aviation can be excused for thinking only one LSA seaplane is available. Established LSA companies like Progressive Aerodyne and their Searey or Scoda’s Super Petrel or Airmax’s SeaMax or any number of aircraft to which floats have been fitted may be somewhat baffled by the outsized attention Icon Aircraft’s long-delayed A5 receives from aviation and non-aviation media. On the other hand, most leaders of these companies do admit that Icon’s media juggernaut also brings attention to LSA seaplanes in general. With that in mind, are you ready for one that might out-WOW the A5? You cannot ride a Wave today, but 2017 may be the breakout year for this impressively-configured LSA seaplane entry from the other down-under country of New Zealand. Indeed, principal, Paul Vickers — the namesake of Vickers Aircraft — wrote at the end of 2016, “Great strides have been made in the past months here at Vickers. Read More About: Vickers Aircraft Company, Ltd. This a rendering of Wave's upper fuselage center of Wave. Get a more complete view of the airplane in this article. In this image the windscreen mold has just been cured in Vickers' oven and is now ready for the first batch of screens to be made. Unless you’ve had your mind on other pursuits — oh, for example, preparing to head to Sun ‘n Fun 2016 next week (the show runs April 5-10) — you could hardly miss the growing buzz surrounding Icon. A soft whistle of air escaping the cabin turned into a deafening roar as Aero-News.Net (always fast with news), AOPA online, AVweb and others piled on to a story about Icon’s 40-page A5 purchase contract. Credible journalistic work was done by Jim Campbell, Jim Moore, and Paul Bertorelli (respectively of each of the publications mentioned above) in documenting the behemoth contract. I have an opinion too — one part respectful of the California company’s wish to protect their brand and their investment and and one part saying, “What the…?” I see no reason to delve into further than the lengthy stories my fellow writers already posted. 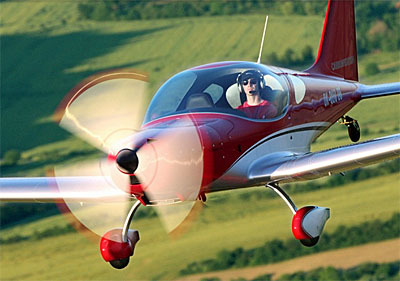 Instead, I like following what’s new in Light-Sport Aircraft, light kit aircraft, and ultralights. Vickers is completing all component elements including the CNC bullet sump (top) and tooling for the fuselage. Big power is not just for LSA taildraggers anymore. A few years back, CubCrafters surprised the LSA world with its installation of the most powerful engine in the LSA space. The western U.S. company mounted a Titan engine from ECi making the modest Cub-like airframe perform far better than the old versions from the Piper company. At the time, this potent powerplant raised eyebrows for two reasons. First, it seemed an excess of power for the then-new lightweight class of airplanes FAA had just regulated into existence. Most had been using one of the 9-series engines from Rotax, which in some cases was itself a move up from a two-stroke Rotax 582 providing 65 horsepower. CubCrafters limited power after takeoff to maneuver within the regs, though, honestly, who would continue using so much power in cruise or while sight seeing? Secondly, the Cub-style airframe is already near the upper LSA empty weight calculation so CubCrafters' engineers had to add many costly carbon fiber elements to keep the empty weight low enough to fit in the class. Compared to the Rotax 912, Titan beefy engine adds considerable weight so the airframe diet represented considerable work. All the handsome carbon fiber also boosted the price of the CarbonCub to breathtaking levels. Nonetheless, the company made it work so well that they have set the pace for airplane deliveries in the LSA space for several years. Since they broke the mold, however, other companies such as American Legend and Zlin have installed the engine to offer essentially the same performance characteristics ... and they've been able to push the price down to levels ByDanJohnson.com readers are more likely to embrace. However, one strongly emerging class of airplane is the LSA seaplane, and you might think that this higher-empty-group of designs could benefit from more power. 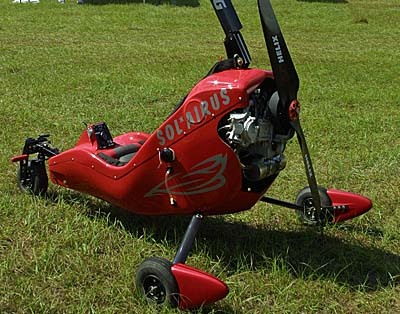 Indeed, Rotax recently announced their new 915 model (video) offering 135 horsepower. Given the Austrian company's vast global network and overwhelming market acceptance, the 915 seems destined to be a success story. However, 915 won't arrive on the market until 2017, the company detailed at their Oshkosh press conference. In the meantime, another LSA seaplane has seen an opportunity. In May 2015, Continental Motors Group, a division of China aviation giant, AVIC, announced it purchased all the asset of Engine Components International, or ECi, maker of the Titan engine and other engine parts. Simply put, the Titan 300-series is now part of Continental Motors, giving the powerplant added funding and a massive international network. The acquisition gives Continental a strong foothold in the experimental market via ECi's Titan line of engines, which includes the X320, X340 and X370 models, which, interestingly, are all based on Lycoming type designs. In our video below (or click here) ECi's Miguel Soto tells you more about the Titan engine used by Vickers. I've followed and written about Vickers Aircraft's coming Wave here and here. 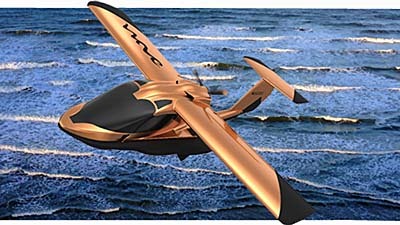 Along with Icon and MVP.aero, Wave appears to be a third generation design in the 11-year-old LSA world. All three models have superb design ideas — each different in their own ways — and represent state-of-the-art creations among Light-Sport Aircraft. With a new announcement, Wave is increasing the ante significantly. Big power is not just for LSA taildraggers anymore. A few years back, CubCrafters surprised the LSA world with its installation of the most powerful engine in the LSA space. The western U.S. company mounted a Titan engine from ECi making the modest Cub-like airframe perform far better than the old versions from the Piper company. At the time, this potent powerplant raised eyebrows for two reasons. First, it seemed an excess of power for the then-new lightweight class of airplanes FAA had just regulated into existence. Most had been using one of the 9-series engines from Rotax, which in some cases was itself a move up from a two-stroke Rotax 582 providing 65 horsepower. CubCrafters limited power after takeoff to maneuver within the regs, though, honestly, who would continue using so much power in cruise or while sight seeing? 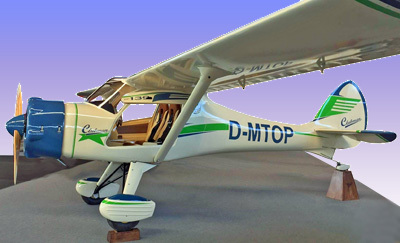 Secondly, the Cub-style airframe is already near the upper LSA empty weight calculation so CubCrafters’ engineers had to add many costly carbon fiber elements to keep the empty weight low enough to fit in the class. Windscreen template being test fitted, prior to trimming the first screens. CNC machined rear empennage and vertical tail plug taken prior to mold being produced and first article. As I've written a few times, I see a dichotomy in LSA designs. Landplanes appear to have entered a "mature" phase, where changes are incremental, evolutionary rather than revolutionary, if you will. I see nothing wrong with that. To the contrary, it speaks to an industry that knows where it is going and how to achieve design goals. Electric propulsion is still stirring things considerably (witness several recent articles here and elsewhere) but electric motors can work on landplanes or seaplanes. 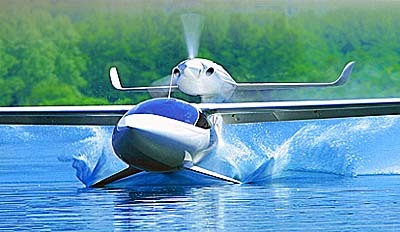 To my view, it appears the lead in the most innovative design is being done in LSA seaplanes. Perhaps this was triggered by Icon and their A5. The California entry is handsome and well enough marketed to collect many orders. While finally coming to market A5 has been a decade in preparation. This left the door open for more highly innovative entries Meanwhile existing designs such as Searey and Super Petrel have been much refined and have demonstrated meeting ASTM standards with Searey also achieving Chinese Type Design Approval. Another innovative design, called MVP, looks mighty intriguing but is still some years away from reaching the market. However, rather quietly and thousands of miles away from California, Vickers Aircraft has been steadily working on their Wave. "Earlier this year we secured substantial investment," reported boss Paul Vickers. "We worked hard over the prior twelve months to seek suitable investors from the USA and we found what we needed." I can imagine that the rather dramatic and fresh design of Wave helped inspire investors to open the checkbook. Thanks to a major injection of capital the pace has quickened as you can see in the development photos accompanying this article. "We are building a 'conforming prototype' that is production ready, meaning that no redesign work or retooling is required to enter production, said Paul. "Once we have completed the current build we will begin working on the first customer delivery, components and parts for which have already been made. The first customer delivery is scheduled for mid-2016." "We are manufacturing all components, both alloy and carbon fiber in house," Paul noted. "This ensures complete accuracy both dimensionally and with regards to weight. We are very pleased that our design weights match actual part weights. We have opted to use prepreg carbon fiber as is generally used on supercars and Formula One race cars so that we can assure the desired repeatability during production." Many steps have been taken during the design process with an eye to serial production. Vickers reports completing sufficient work at this point to see their fit to the marketplace. "We expect our price will be competitive due largely to keeping the unique part count to around 400, considerably less than that mentioned by other aircraft companies," Paul explained. "This coupled with a realistic investment in Vickers to-date appealed to our new American investors as it offers a stable and sustainable platform moving forward." "We are very excited to bring this aircraft to market and we are getting closer to that reality every day," said Paul. "We are looking forward to unveiling some truly exciting innovations that will make the Wave stand alone." One major difference in Wave from all the others is the planned use of a 180 horsepower engine that he calculates will produce a 120-knot cruise. At such speeds, Wave would be the fastest of the breed. Pry as I might, Paul would not divulge all his secrets. Yet he did agree to share some very interesting design features if I agreed not to write about them yet, and in so saying, he further piqued my interest. This is one reason why I see LSA seaplanes as the point of the spear, design-wise. Vickers has lined up a number of what they call "strategic partners." For example, emergency airframe maker BRS has entered into a new developmental partnership with Vickers Aircraft. "The truly innovative and well thought out design of the amphibious Wave aircraft, when coupled with BRS' long standing leadership role in aircraft recovery parachutes, creates an aircraft that may well set a new standard in performance, fun, and of course, safety," stated Boris Popov (video), founder and senior vice president of sales at BRS Aerospace. "BRS is honored to have been selected by Vickers for integration into this new aircraft design." "Stand alone styling that is both smooth and strong, incredible innovations, intuitive systems wrapped in functionality for a price that will stun..." expressed Vickers CEO Paul Vickers. "That is the Wave." I look forward to inform you further as more details and images leak out of Vickers Aircraft. As I’ve written a few times, I see a dichotomy in LSA designs. Landplanes appear to have entered a “mature” phase, where changes are incremental, evolutionary rather than revolutionary, if you will. I see nothing wrong with that. To the contrary, it speaks to an industry that knows where it is going and how to achieve design goals. Electric propulsion is still stirring things considerably (witness several recent articles here and elsewhere) but electric motors can work on landplanes or seaplanes. 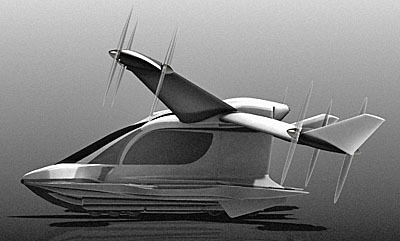 To my view, it appears the lead in the most innovative design is being done in LSA seaplanes. Perhaps this was triggered by Icon and their A5. The California entry is handsome and well enough marketed to collect many orders. While finally coming to market A5 has been a decade in preparation. This left the door open for more highly innovative entries Meanwhile existing designs such as Searey and Super Petrel have been much refined and have demonstrated meeting ASTM standards with Searey also achieving Chinese Type Design Approval. 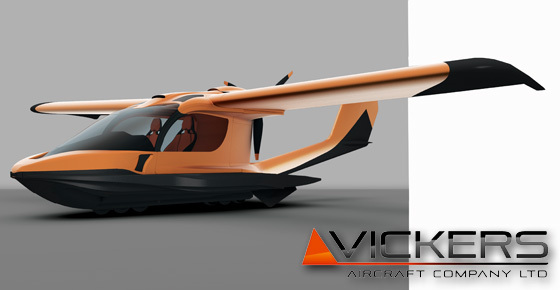 After a rush of interest owing to earlier reports (see here and here), the team at Vickers Aircraft went head down and began pushing even harder on their fascinating new amphibious LSA seaplane entry called Wave. As you can see by the photos, they've now unveiled the overall appearance though additional details of this rather distinctive creation will be released as components are fitted and evaluated. Meanwhile, for those who want more, principal designer Paul Vickers added, "I am pleased to inform that our Vickers Aircraft website is now live. We invite pilots around the world to come have a closer look and to observe which companies we are engaging as partners. "We have achieved our production weights on completed assemblies," noted Paul, including wings, tail stabilizers, controls, and composites structures such as the cockpit and sponsons." Vickers says they achieved this by strategically combining aluminum and carbon fiber. Advanced designs use a mix of materials in areas that have varying strength requirements. "We spent a lot of time before the initial design was started working on construction techniques to ensure they could be transferred to the aircraft design and used in production. "We then took this proven solution into the design phase early 2010 and have now produced numerous components that are matching our design weights," added Paul. With a reported 80% of the prototype completed Vickers Aircraft said their clean-sheet design should achieve target weights enabling Wave to be an FAA-accepted Special LSA without any need for a weight exemption. Part of assuring weight targets are met — keep in mind that the LSA seaplane gross of 1,430 pounds (650 kg) can be demanding for a capable aircraft with retractable gear and other water-worthy features — means close coordination with leaders in carbon fiber. "We are very pleased to introduce Core Builder Composites as our partner to supply the carbon fiber components, said Vickers. Sailing enthusiasts may already know this company's work through their most celebrated product, the Oracle yacht that won the America's Cup this year as one of the fastest boats in the world. Core Builder Composites met the demand for a 72-foot catamaran that appears to zoom above the water (photo) while using a sail that looks for all the world like a long half-wing instead of a billowing fabric sail. Given the intense — and very well funded — competition for America's Cup sailboats, the company based in New Zealand along with Vickers appears well equipped to do prototype and production work on Wave's composite structures. I've written about the level of competition present in LSA seaplanes, perhaps triggered by the amazing success of California's Icon A5. 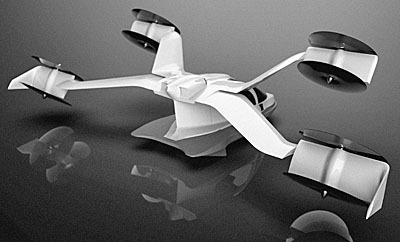 Through very astute marketing Icon has reportedly collected more than 1,000 orders for their amphib seaplane. The company has been breaking new ground in several areas, such as their spin-resistant airframe that earned Icon a weight exemption from FAA. 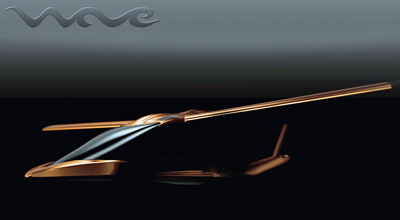 However, the effort has also delayed production and opened an opportunity for other designs to fill the void. This drives Vickers Aircraft to keep the pressure on to have product delivered to customers by summer 2014, a goal they still feel is achievable. While far less well known than Icon because they kept their focus on design and production preparation, Wave is making friends around the globe, reported Paul Vickers. Interest from a number of potential buyers is rewarding the push and the company repeated earlier statements, "Our sale price in the USA will be under $180,000 including the 180 horsepower Lycoming IO-360, automatic folding wings, and airframe parachute." 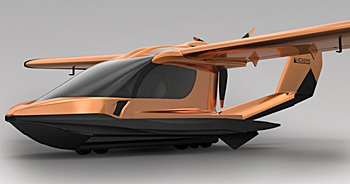 After a rush of interest owing to earlier reports (see here and here), the team at Vickers Aircraft went head down and began pushing even harder on their fascinating new amphibious LSA seaplane entry called Wave. As you can see by the photos, they’ve now unveiled the overall appearance though additional details of this rather distinctive creation will be released as components are fitted and evaluated. Meanwhile, for those who want more, principal designer Paul Vickers added, “I am pleased to inform that our Vickers Aircraft website is now live. We invite pilots around the world to come have a closer look and to observe which companies we are engaging as partners. “We have achieved our production weights on completed assemblies,” noted Paul, including wings, tail stabilizers, controls, and composites structures such as the cockpit and sponsons.” Vickers says they achieved this by strategically combining aluminum and carbon fiber. Workers fit a custom Catto prop to Wave's Lycoming IO-360 powerplant. Following our initial unveil of a new amphibian called "Wave" by Vickers Aircraft Company, more details were offered in their programmed slow-motion rollout of a new amphibian LSA candidate. In this update we hear about who will supply the prop and see some of the hardware components. I was informed that response was brisk after the last article suggesting the tempting way facts are released developed a sense of intrigue. One thing not said earlier is that principal Paul Vickers spent years in marine hull design and fabrication, addressing that aspect of engineering competency. As to the aerodynamic side, Paul wrote, "We are confident in achieving our performance figures as we have spent the pat three years producing and studying the hydrodynamics and aerodynamics needed for our particular flight envelope." Vickers provided performance info to Catto props who developed and delivered a specific propeller to maximize to the airflow produced by Wave's pusher configuration. "This information coupled with the known performance figures of the Lycoming IO-360 should provide a 120 knot cruise," indicated Vickers. Vickers expressed appreciation to Craig Catto at Catto Propellers. "Catto delivered a unique prop (photo) in a short time," Paul emphasized. "We now have a specially designed propeller with hardened nickel leading edges to protect the prop from the effects of water spray. The three blade prop ensures that 180 horsepower delivered by Lycoming's engine is transferred into useful thrust. Some readers wondered about Vickers' ability to meet LSA weight limit, especially give the use of a powerful and relatively heavy powerplant. "We are pleased that completed assemblies including wings, tailplane, and composite structures have been matching engineering design weights." The company said it is confident Wave can provide a useful load of 500 pounds. CAD modeling computer simulations and analysis were intensely employed. "Our aircraft is 100% designed on computers; it's incredible what computers offer modern engineers. One wonders what might have been if the Wright brothers had access to some of the tools we have at our disposal." As the first parts were produced, Vickers engineers were pleased how close theoretical weights matched actual part weights. "With more than 80% of the aircraft built, we are well on our way to meeting our design and delivery goals," Paul observed. Vickers is presently building two aircraft, one for flight tests and regulatory approval and another, the first of several, they say, for delivery perhaps as soon as Oshkosh 2014. The company has been sharing development with regulators for "a speedy approval process." Vickers reported that preliminary response to their "peak-a-boo" announcement was surprisingly strong. (Add your name to their list by emailing Paul Vickers.) However, the company said many inquirers asked a similar question, "We heard about the big engine but what about more complete specs?" 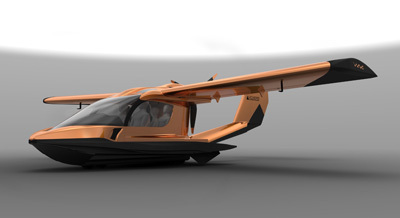 In other words, how will Wave compare to other LSA amphibians? Addressing this request, Vickers Aircraft offered the nearby chart. "We will be releasing progress production pictures and additional information on a regular basis," said Paul Vickers. Though it remains in development, interested pilots can bookmark Vickers Aircraft website for regular updates. Following our initial unveil of a new amphibian called “Wave” by Vickers Aircraft Company, more details were offered in their programmed slow-motion rollout of a new amphibian LSA candidate. In this update we hear about who will supply the prop and see some of the hardware components. I was informed that response was brisk after the last article suggesting the tempting way facts are released developed a sense of intrigue. One thing not said earlier is that principal Paul Vickers spent years in marine hull design and fabrication, addressing that aspect of engineering competency. As to the aerodynamic side, Paul wrote, “We are confident in achieving our performance figures as we have spent the pat three years producing and studying the hydrodynamics and aerodynamics needed for our particular flight envelope.” Vickers provided performance info to Catto props who developed and delivered a specific propeller to maximize to the airflow produced by Wave’s pusher configuration. I've written a number of articles about LSA seaplanes ... about the several we already have in the fleet (Aventura news), and about new designs to come (quick tour of many new LSA and Ultralight seaplanes). One of new ones is called Wave from Vickers Aircraft Company and the new entry is starting to peek from behind the dark curtain. Along with other designs in development, the Vickers project merits close attention as it offers genuine out-of-the-box thinking. Previously I agreed not to say more, governed by a non-disclosure agreement. However, at AirVenture 2013 I ran into Director and principal designer Paul Vickers. After talking about his sponsorship of EAA's Young Eagles program Paul told me he was finally ready to make some announcements about his project. Following are a couple glimpses. Another man with inside knowledge said, "This is the coolest, sexiest aircraft coming to market. Wave is breathtaking." The speaker: Bill Canino of SportairUSA and winner of the LAMA 2013 President's Award to an Outstanding Individual. This tiny slice of the airframe (image) where wing meets fuselage is all Vickers is willing to show right now. They've begun the peek-a-boo unveiling to tempt early position orders. Much like Icon Aircraft did some years back, Vickers Aircraft plans to collect a small deposit from early adopters and will give them special perks for jumping on board sooner. For example, Vickers is offering their first 100 position buyers a percentage discount off a seaplane expected to go for a price similar to Icon's A5. The offer is a fairly serious motivator, as much as a $37,000 discount. Icon came on the market at $139,000 but in what is often called "constant dollars" (meaning that today's price involves more dollars, thanks to inflation). Icon buyers making recent delivery position orders report a price similar to what Vickers is considering for their Wave. While both aircraft are impressive, Wave has some unique qualities. Vickers Aircraft may be teasing your interest but the company did reveal one very interesting choice: the engine — a Lycoming IO-360, putting out 180 horsepower. Now we've seen engines from CubCrafters and Zlin offering similar power and UL Power has some non-certified engines getting close. Still, offering a bigger displacement Lycoming brand engine at this power on a seaplane notably compares to the Icon A5's 100-horsepower Rotax 912 iS. Paul told me several reasons why he made that decision from the start and he'll begin discussing this publicly as time goes on but he'll inform early customers even sooner. Oliver Leber, OEM Sales Manager for Lycoming Engines said, "We have enjoyed working with Vickers on this project, and are excited to see this kind of innovation in the world of general aviation." Vickers Aircraft Company also said their amphibian will come with automatic folding wings. 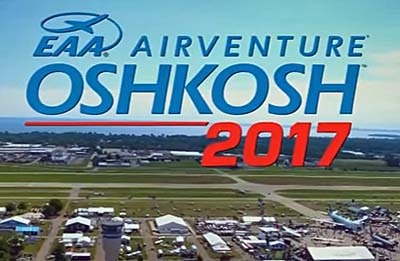 Paul Vickers promised, "We're planning to deliver production aircraft at EAA AirVenture Oshkosh 2014." If he makes this schedule — the project has been in development for three years already — he may tie or could even beat Icon to market. "Delivery positions are now available," said Vickers. To get your name on the list and to receive information, email Paul Vickers. Assisting Vickers is Abid Farooqui of SilverLight Aviation. When working on a similar project SilverLight Aviation drew unusually supportive comments from various FAA personnel after successfully completing a full audit. I hope Paul will keep leaking details of his new seaplane. We'll be keeping an eye on this one. I’ve written a number of articles about LSA seaplanes … about the several we already have in the fleet (Aventura news), and about new designs to come (quick tour of many new LSA and Ultralight seaplanes). One of new ones is called Wave from Vickers Aircraft Company and the new entry is starting to peek from behind the dark curtain. Along with other designs in development, the Vickers project merits close attention as it offers genuine out-of-the-box thinking. Previously I agreed not to say more, governed by a non-disclosure agreement. However, at AirVenture 2013 I ran into Director and principal designer Paul Vickers. After talking about his sponsorship of EAA’s Young Eagles program Paul told me he was finally ready to make some announcements about his project. Following are a couple glimpses. 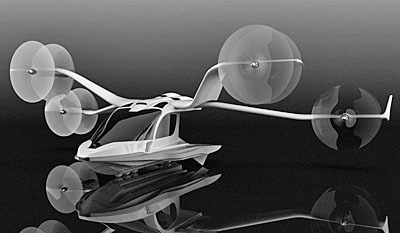 Another man with inside knowledge said, “This is the coolest, sexiest aircraft coming to market.